Richard Gere (Days of Heaven, Arbitrage) is never going to be a great actor, but Internal Affairs is the movie in which he suggested he had the potential to be a very good one if given the right part and guided by a confident director. In the late 1980s his career had hit a major slump following a succession of duds in which he had been called upon to do little more than turn up and look pretty, but first Internal Affairs, and then Pretty Woman, catapulted him back onto the A-list. 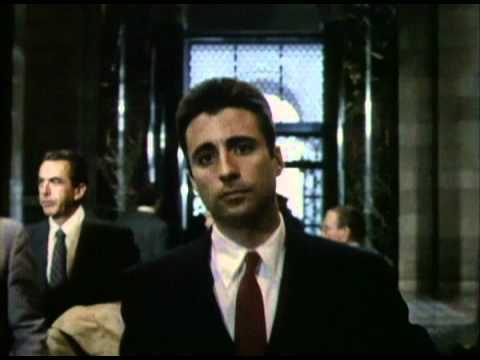 Given the quality of his performance here – poor Andy Garcia (Ocean’s Twelve, Smokin’ Aces) is just a shadow in their scenes together – it’s something of a surprise that Gere didn’t choose to take on more villainous roles. 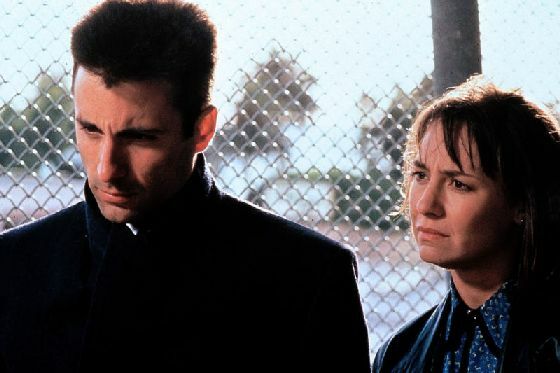 Garcia plays Raymond Avilla, an ambitious new Internal Affairs officer in Los Angeles, whose first job with partner Amy Wallace (Laurie Metcalf — Toy Story) is to investigate allegations that beat cop Van Stretch (William Baldwin) planted drugs on a suspect. Avilla isn’t long into the investigation before he begins to suspect that Stretch is just a small cog in large operation run by his partner Dennis Peck (Gere). Although Peck is also a beat cop he lives in a large house, drives a flashy sports car and pays maintenance for half-a-dozen kids from previous marriages as well as looking after two from his current one. Even though his decision to go after Peck meets with opposition from some higher up in the department because of Peck’s impeccable record, Avilla pushes on with his investigation. However, he fails to appreciate the devious ingenuity of his target, and finds himself embroiled in a psychological war with Peck that threatens to destroy his own marriage and career. Dennis Peck is one of those human monsters whose innate evil is camouflaged by an affable manner. Apparently, he’s based on the character of Iago from Shakespeare’s Othello, one of the Bard’s most evil creations who used his intuition for identifying and exploiting the desires of others for his own gain. But there’s another side to Peck, one that seeks to protect his family from harm and who commits the crimes he does for the sole purpose of maintaining the precarious balance of his life. Peck is a monster, but he doesn’t realise the fact, and would probably consider himself to be one of the good guys, which is what makes him such a fascinating character. Casting of this part was critical, because the success of the entire movie depends on getting it right, and fortunately Gere’s swaggering charm fits the character perfectly. Unfortunately, the character of Avilla is not so well defined and it’s something of a mystery how writer Henry Bean can get the balance so badly wrong. Perhaps it’s Garcia’s interpretation of the part; he plays it like a text book movie villain – eyes unblinking, head still, face emotionless – before periodically exploding with rage as if he’s Al Pacino’s biggest fan. These paroxysms of fury take Avilla from the bland to the bizarre, turning him into a wife-beating bully, and having him threaten potential witnesses with prison and separation from their kids simply because the information they offer isn’t good enough. By this point in the movie, the battle lines have already been clearly defined, so why Bean suddenly decides to muddy the waters by having Avilla behave like the bad guy doesn’t make much sense. Presumably it’s supposed to show how deeply under his skin Peck has crawled, but it doesn’t really work. Despite this disparity in the characters and the film’s tendency to run through a number of cop movie cliches, Internal Affairs remains consistently engaging throughout, thanks to some first-class direction from Mike Figgis. It’s starting to date, and has something of a Miami Vice feel about it at times, but it still makes for compelling viewing even though it never quite qualifies as a classic.